One word summary for the book- “Healing”. If doctors agreed there was a mind-body connection, why couldn’t they openly teach and pursue those options? Why, if almost 30% of patients responded to a placebo effect, wasn’t that getting top financial and scientific support? Understanding the link between the mind and body, Lissa decided that “Promoting health of the body without encouraging health of the mind is an exercise in futility.” “The Physiology of Emotion” was the real topic that needed addressing. Bernie Siegel M.D. once stated that “to heal is to alleviate suffering – not to stop “death”.” Lissa seems to share the idea. Acknowledging that all outcomes vary, as we can’t know “what lessons we’re here on this earth to learn“, she does show us how we can at least tip the scale in a more proactive approach to our health and abilities of our body. “Try visualizing a grounding cord, coming out of your bottom like an electrical cord or tree roots” and releasing down that grounding cord the un-serving thoughts, and then uploading healing light from it. Did you know that Loneliness, could forecast more accurately the overall health of a person, than did their exercise, smoking, or eating habits? Lissa discusses the “Whole Health Cairn” which you may have seen on TEDx talk in 2011. This is a balance of many aspects of life, all centered upon your “Inner Pilot Light”. I’d recommend the book to anyone as it covers so many topics easily understood by both the science and medically studied, as well as the first timer to any mind-body study ideas. Truly a great work with a noble intent. Thanks Lissa. 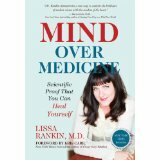 This entry was posted in Book Reviews, Daily Blogs and tagged book reviews, health through balance, healthy living, Lissa Rankin, Loneliness, M.D., Mind Over Medicine, Positive Emotions, Whole Health Cairn by MomentumMikey. Bookmark the permalink. First I read books by Michio Kushi about macrobiotic way of life. Then books about meditation, do-in, positive thinking, accupressure, self-hypnosis, etc. THANKS!! I like to learn as much as possible, and am always open to different (new to me) authors and perceptions about life, happiness, and health. Thrilled you stopped by, I’ll check out some of Kushi’s stuff. 🙂 have a great sunday! Wow, so glad I came across your blog! I love the concept of the book and your concise, short summary of the book. I will be following you, and finding a copy of this book to get my paws on. *Gleeful Expression. I’ve done a good deal of study on both biology and psychology, and love reading things about how they affect one another. The human body is truly an amazing thing! Generally, what types of books do you review? thanks for reading! I read and review Personal Transformation book, (self-help) and sometimes physics or medical or anything in between. never novels. I only started a couple months ago, but there’s a list of books so far reviewed on right side of page at 4lawofattraction.com (full site) – enjoy the book and hope you get as much out of it as I did. and again THANKS!